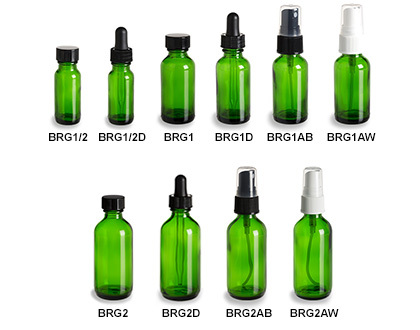 Our green Boston round glass bottles are a brilliant choice for food, cosmetic, or medicinal products. These high-quality green glass food grade bottles provide UV protection for light-sensitive oils and extracts. This bottle style features classic rounded shoulders and smooth sides which are ideal for labeling. These attractive bottles are priced to include your choice of closure: standard black caps, droppers or atomizers.